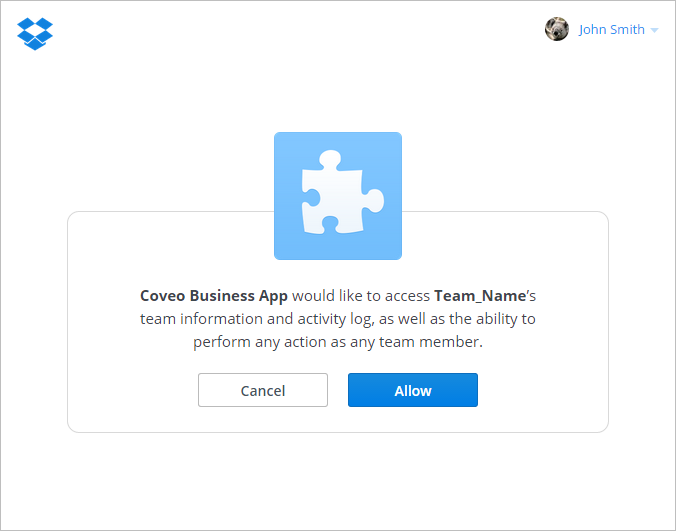 You must perform the OAuth 2.0 protocol to authorize the Coveo connector to access the Dropbox content of your team members. The OAuth 2.0 protocol is a protocol used for granting access to external applications without exposing the user's real credentials. For the connector to be able to connect to your team members Dropbox, it must acquire an access token. Note: CES 7.0.7711– (June 2015) You can also grant the access to the Dropbox of your team members using the OAuth 1.0 protocol which requires an application key, an application secret, an access token, and an access token secret. Note: This topic describes a procedure using Google Chrome and the Advanced Rest Client extension. However, it can be done with other browsers and extensions, such as Firefox and the RESTClient plugin. Log into the Dropbox website with an administrator account. Access the Create a new Dropbox for Business app page. Under What type of app do you want to create?, select the Team member file access check box. In the Provide an app name, and you're on your way box, enter a descriptive name of your choice for the application. 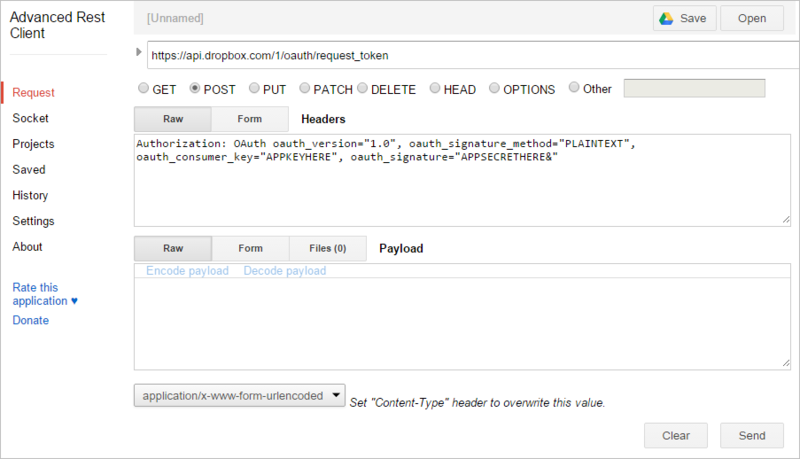 In the OAuth 2 section, under Generated access token, click Generate. Take note of the Access token of your application. CES 7.0.8047+ (December 2015) Configuring your user identity (see Dropbox for Business Connector Deployment Overview). CES 7.0.7914– (October 2015) Configuring your Dropbox for Business security provider and source (see Configuring a Dropbox for Business Security Provider and Configuring and Indexing a Dropbox for Business Source). Note: You can now create a Dropbox for Business security provider (see Configuring a Dropbox for Business Security Provider). CES 7.0.7711– (June 2015) When you want to use the OAuth 1.0, take note of the App key and App Secret of your application. You need these values when configuring your Dropbox for Business security provider and source (see Configuring a Dropbox for Business Security Provider and Configuring and Indexing a Dropbox for Business Source). Note: With these two information in hands, you can make API calls to get an OAuth token secret and an OAuth token (see step 2). Important: For security reasons, you have a limited time to complete this step before the session expires. If this situation happens, you have to start the procedure over again. Thus, it is recommended to read and understand the procedure before starting following it. Access the Advanced REST client Google Chrome extension page, and then click the + Free button. Note: You are asked to download Google Chrome if you did not have the browser installed on your computer already. In the Confirm New App dialog box, click Add. In the Apps page, open the Advanced REST client plugin. In the URL box, enter https://api.dropbox.com/1/oauth/request_token. In the method list, select the POST check box. Next to Headers, select Raw. In the box under Headers, copy and paste the following code line after entering your App key and App secret previously obtained in step 1d at the specified places: Authorization: OAuth oauth_version="1.0", oauth_signature_method="PLAINTEXT", oauth_consumer_key="YOURAPPKEY", oauth_signature="YOURAPPSECRET&". Note: Leave the & sign at the end of your App secret. Click Send to receive an answer. At the bottom of the page, in the Response box, the answer that you receive looks like the following: oauth_token_secret=YOUROAUTHTOKENSECRETVALUE&oauth_token=YOUROAUTHTOKENVALUE. Note: The & sign is not part of the OAuth token secret. Take note of the OAuth token secret and OAuth token values. Copy and paste the following URL in your browser address bar after entering your OAuth token at the specified place: https://www.dropbox.com/1/oauth/authorize?oauth_token=YOUROAUTHTOKENVALUE. Note: If you had an error like the following: This session has expired. Please return to the app to try again., log again in to your admin Dropbox for Business account. In the [Your app name] would like to access [Team name]'s team information and activity log, as well as the ability to perform any action as any team member screen, click Allow to authorize the connector to index the Dropbox content of your team members. Important: For security reasons, you have a limited time to complete this step before the session expires. If this situation happens, you have to start the procedure over again. Thus, it is recommended to read and understand the procedure before start doing it. 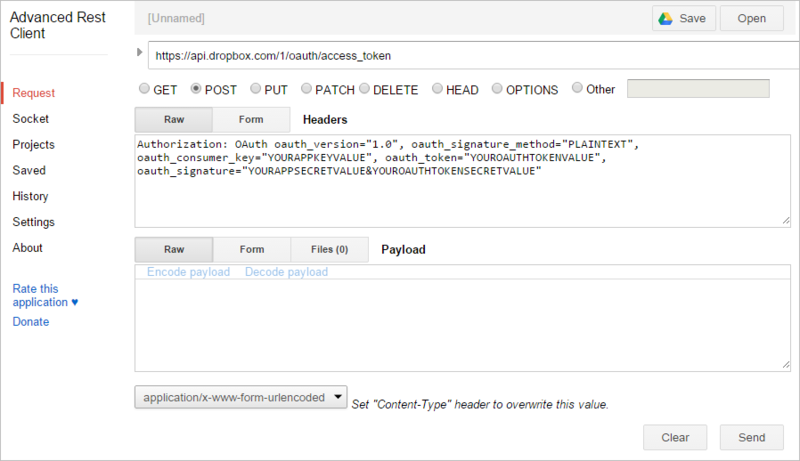 In the URL box, enter https://api.dropbox.com/1/oauth/access_token. In the box under Headers, copy and paste the following code line after entering your App key, OAuth token, App secret, and OAuth token secret previously obtained at the specified places: Authorization: OAuth oauth_version="1.0", oauth_signature_method="PLAINTEXT", oauth_consumer_key="YOURAPPKEYVALUE", oauth_token="YOUROAUTHTOKENVALUE", oauth_signature="YOURAPPSECRETVALUE&YOUROAUTHTOKENSECRETVALUE". Note: Leave the & sign between the App secret and the OAuth token secret value. At the bottom of the page, in the Response box, the answer that you receive looks like the following: oauth_token_secret=YOUROAUTHTOKENSECRETVALUE&team_id=YOURTEAMIDVALUE&oauth_token=YOUROAUTHTOKENVALUE&uid=99026670. The & sign is not part of the OAuth token secret value. The & sign and the alphanumerical characters beyond are not part of the OAuth token value. Take note of the OAuth token secret and OAuth token values. You need these values when configuring your Dropbox for Business security provider and source (see Configuring a Dropbox for Business Security Provider and Configuring and Indexing a Dropbox for Business Source). Create a Dropbox for Business security provider (Configuring a Dropbox for Business Security Provider).